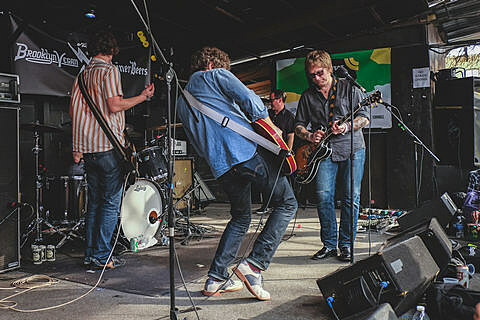 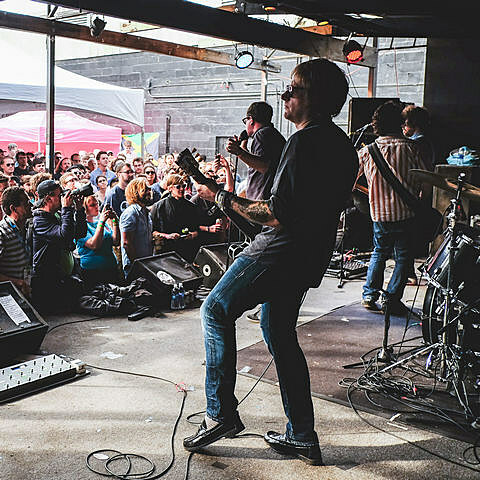 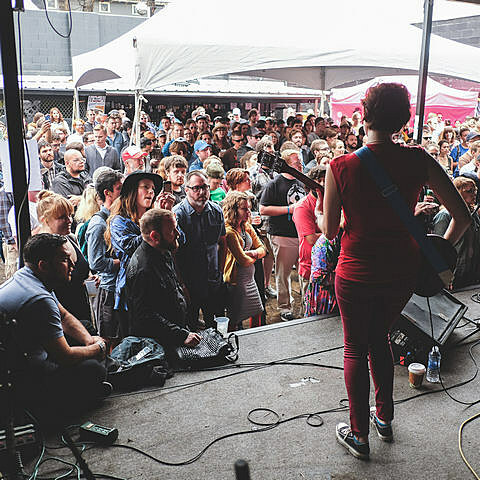 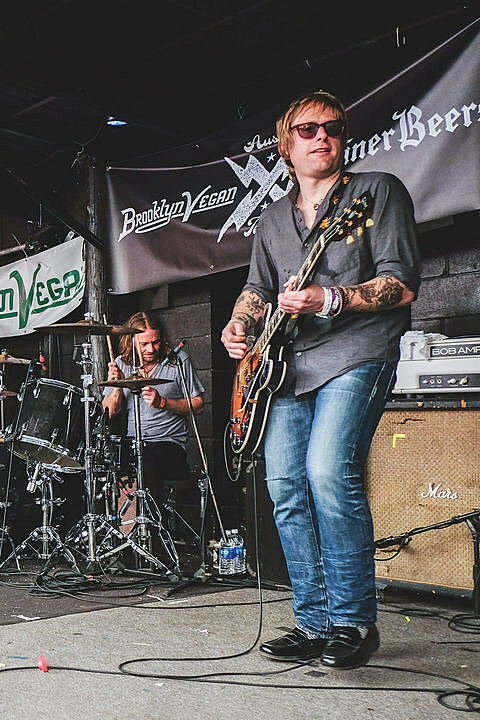 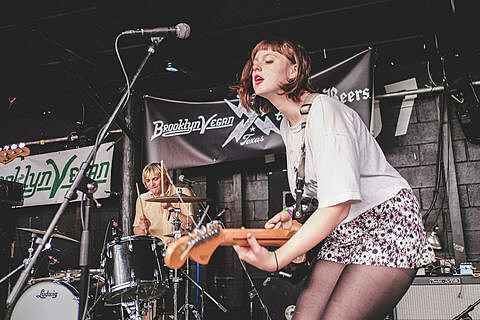 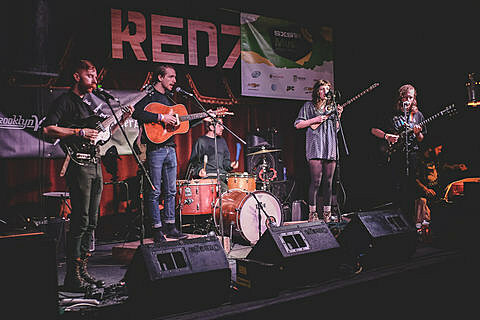 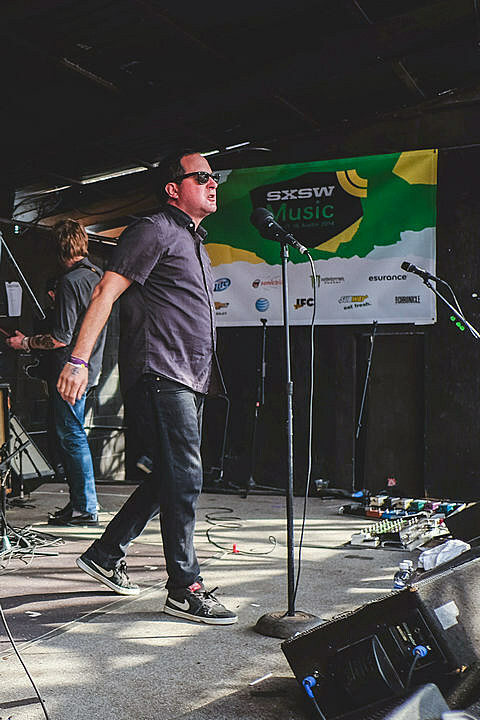 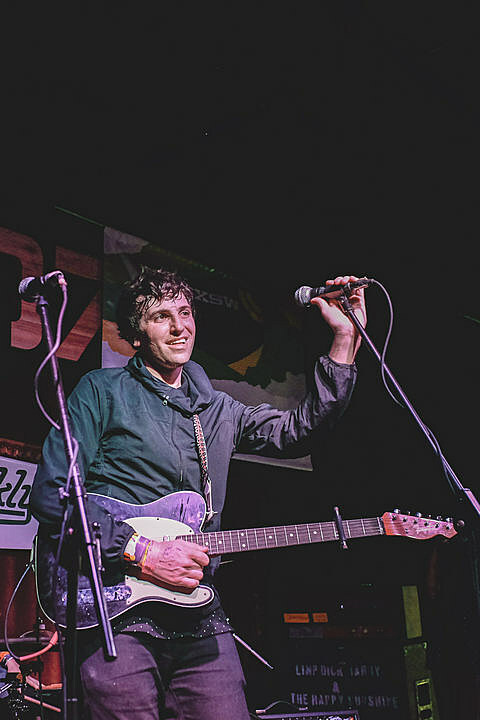 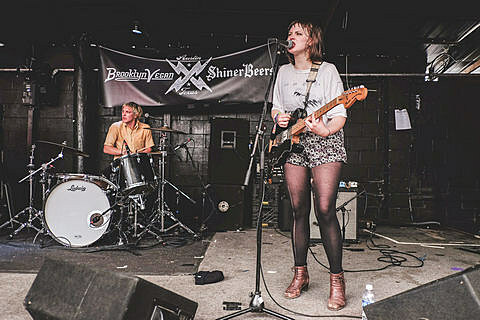 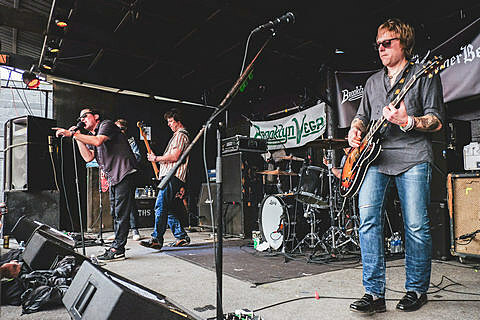 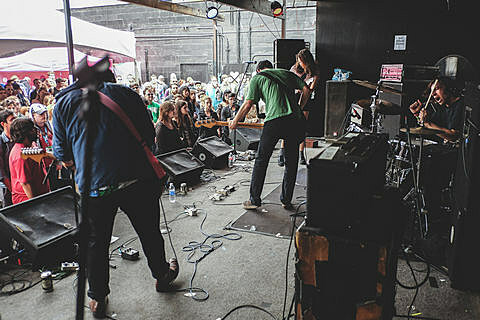 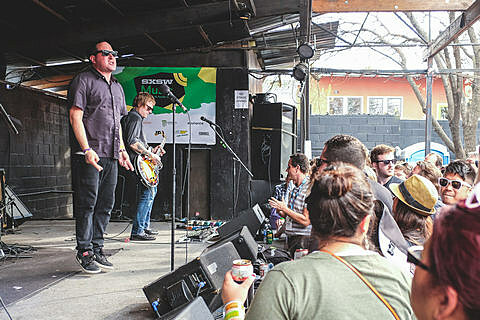 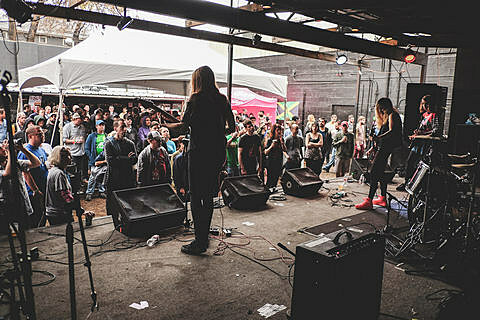 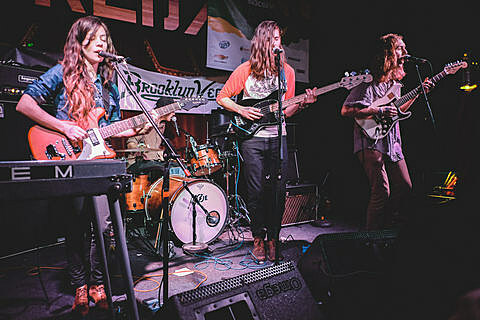 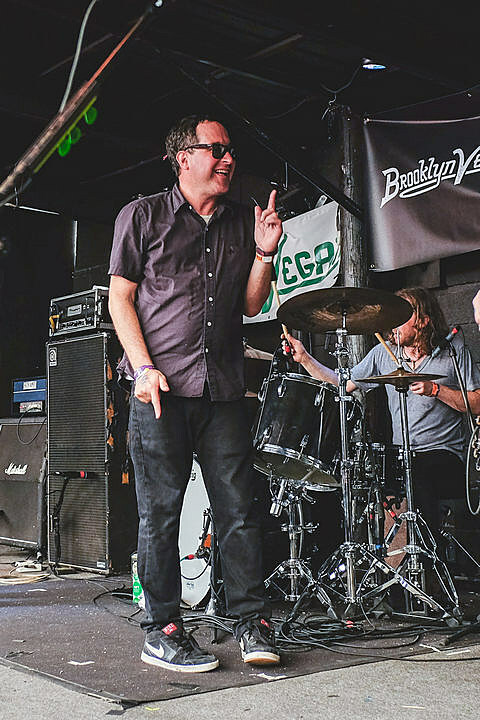 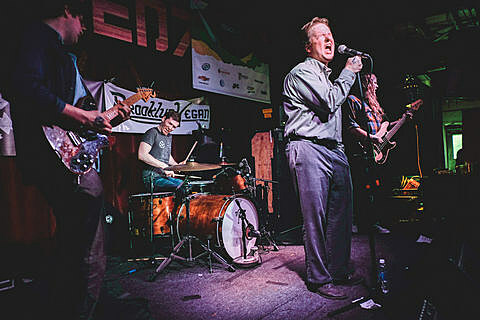 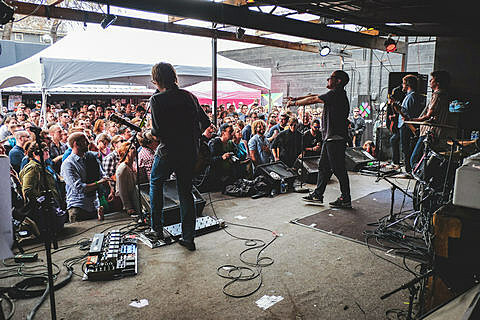 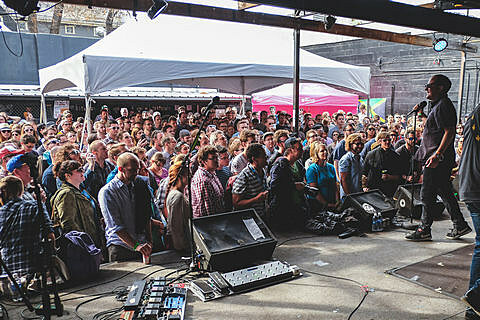 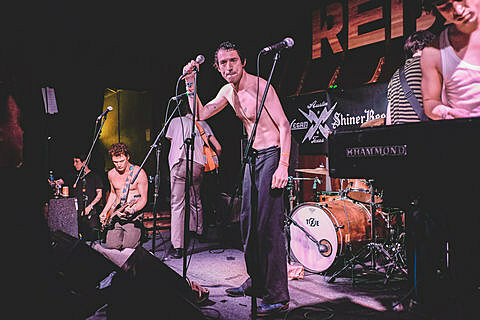 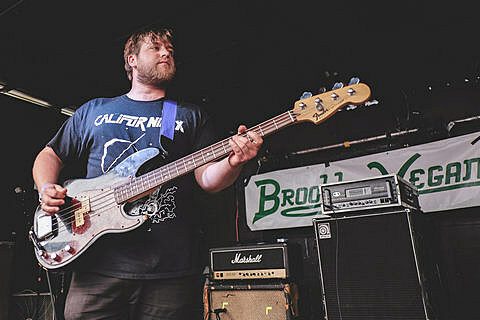 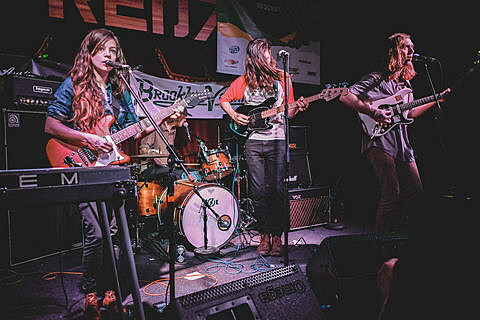 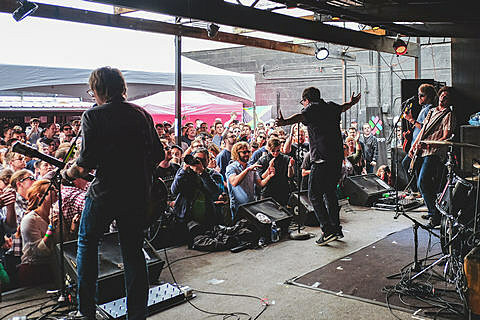 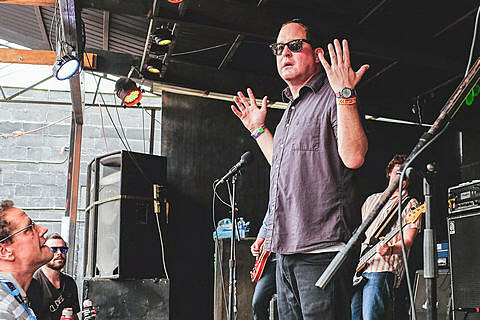 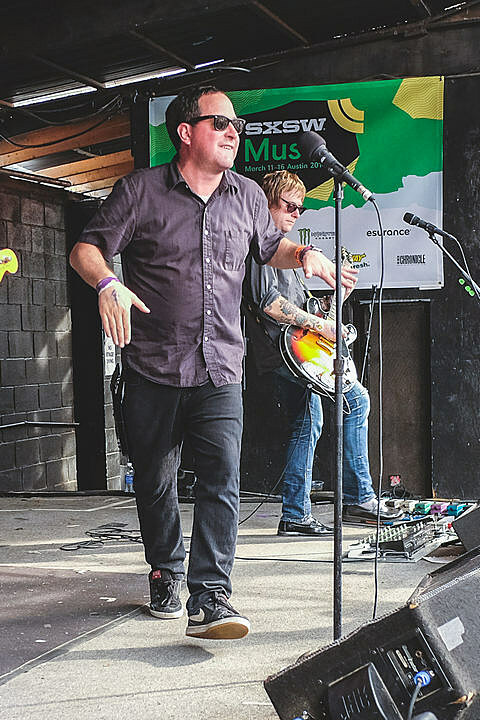 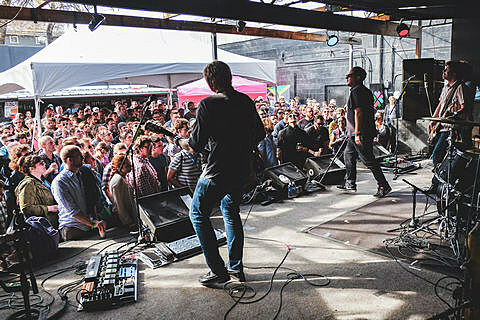 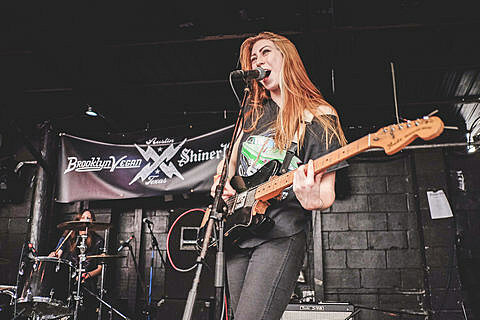 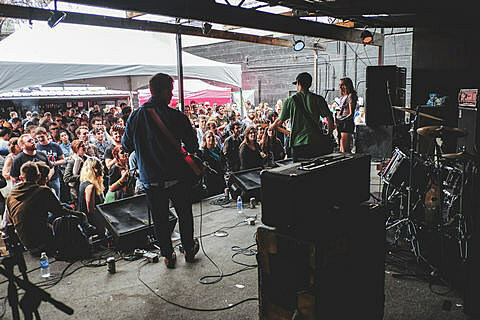 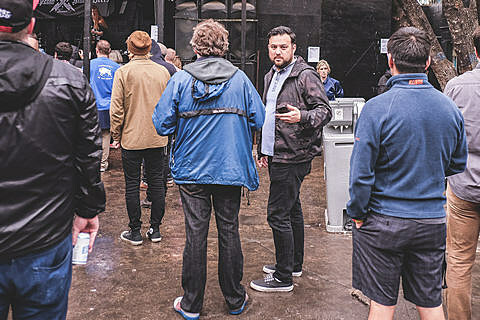 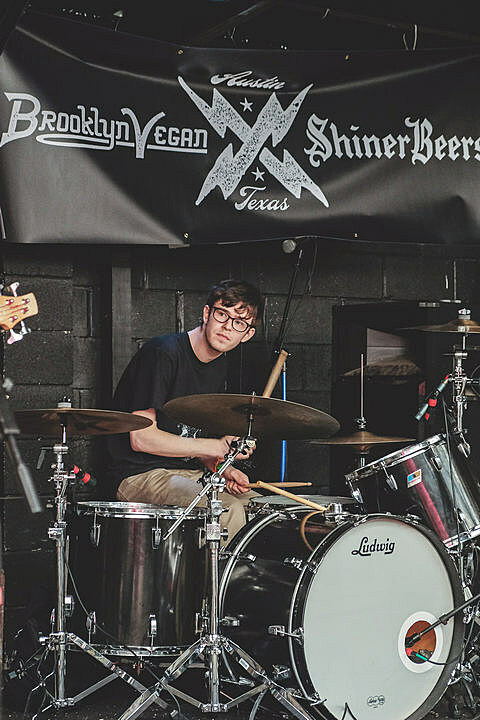 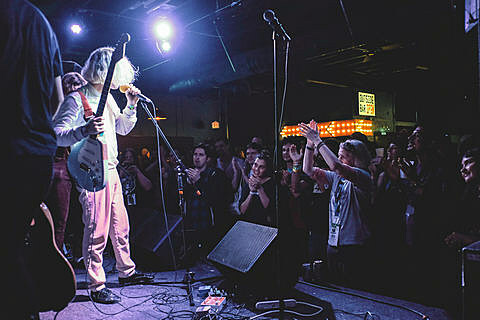 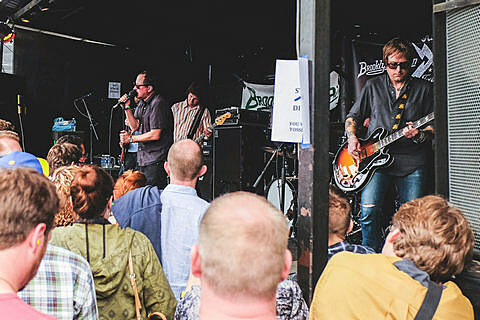 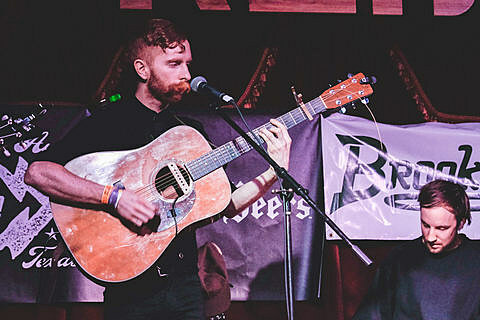 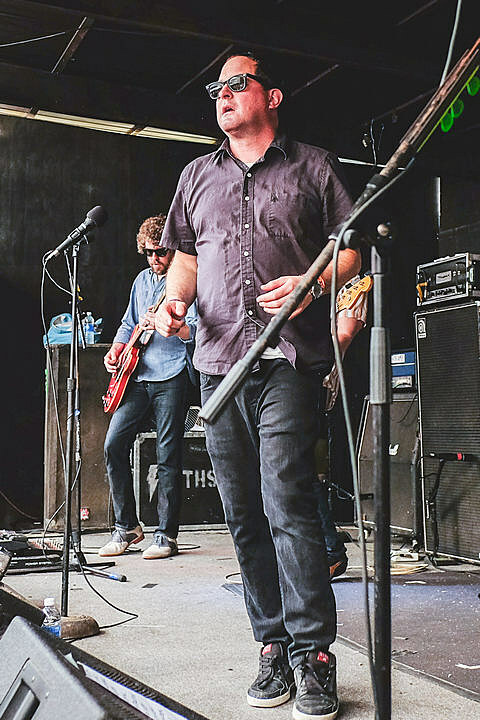 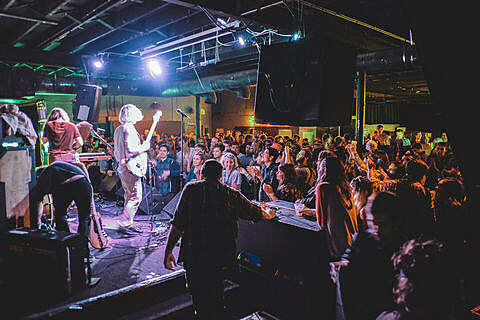 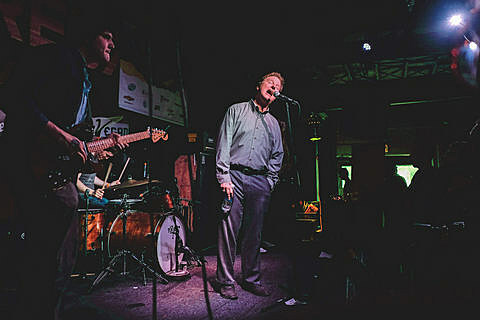 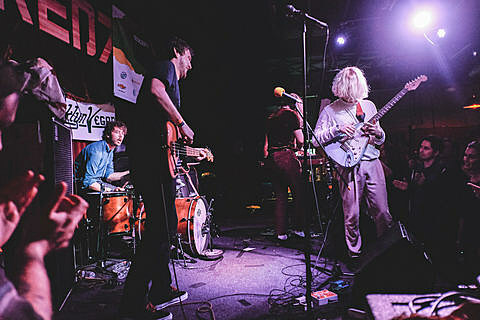 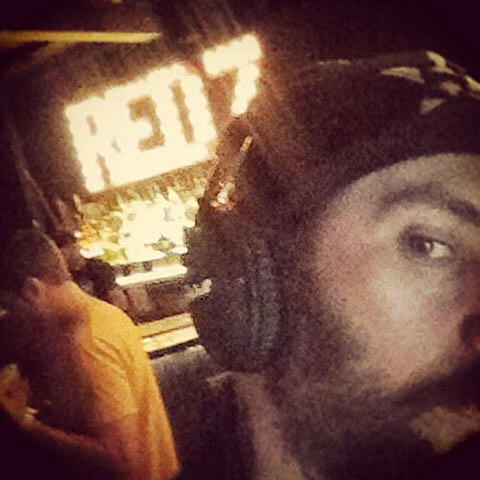 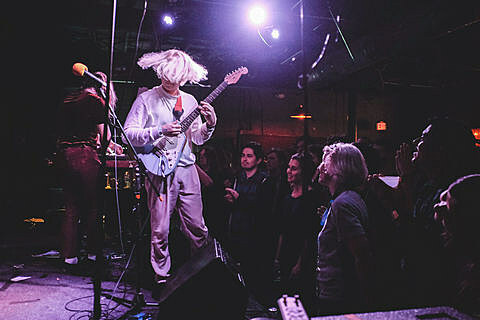 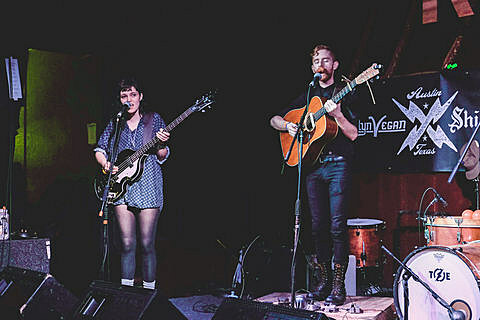 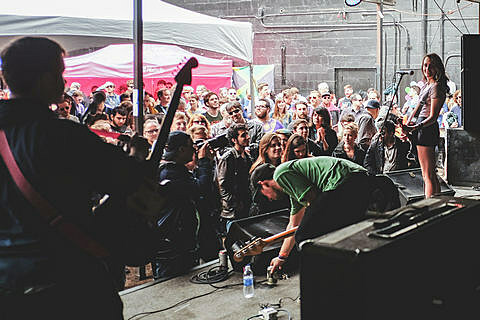 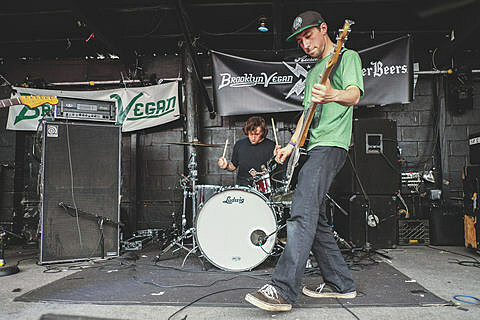 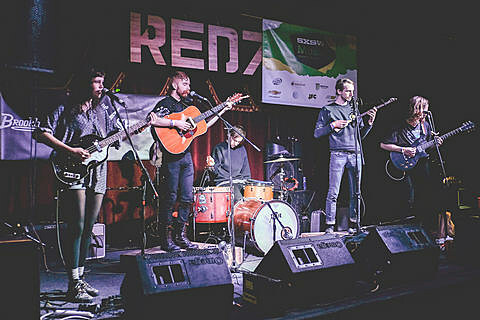 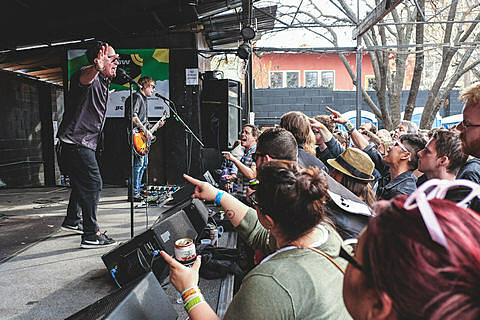 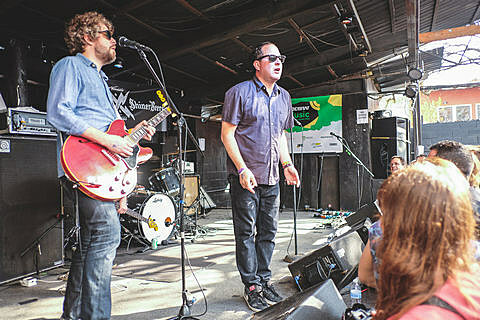 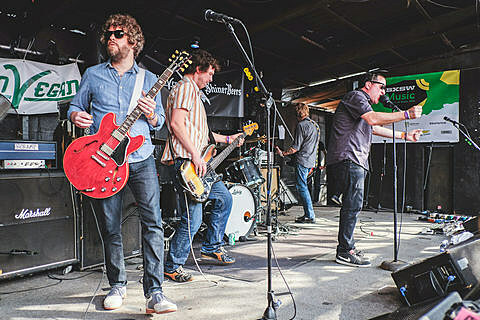 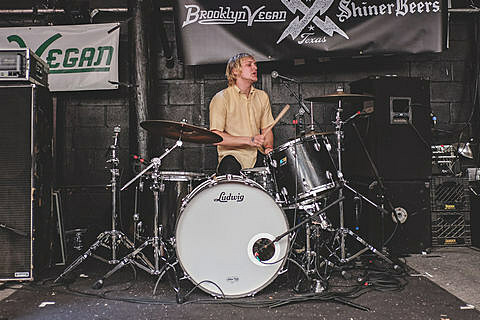 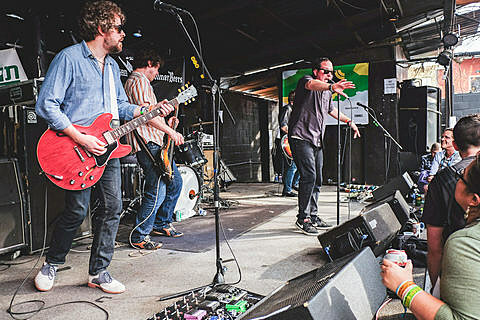 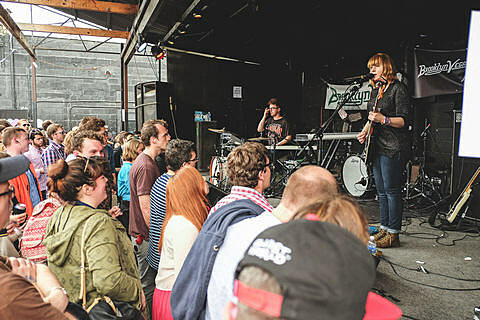 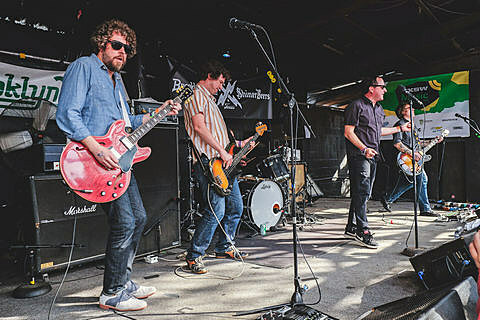 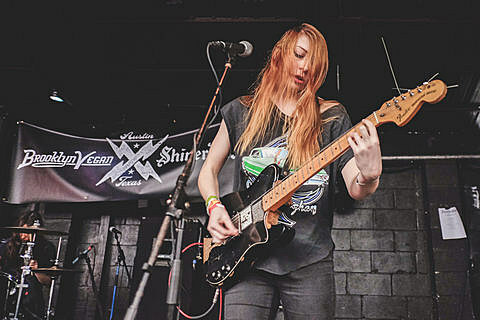 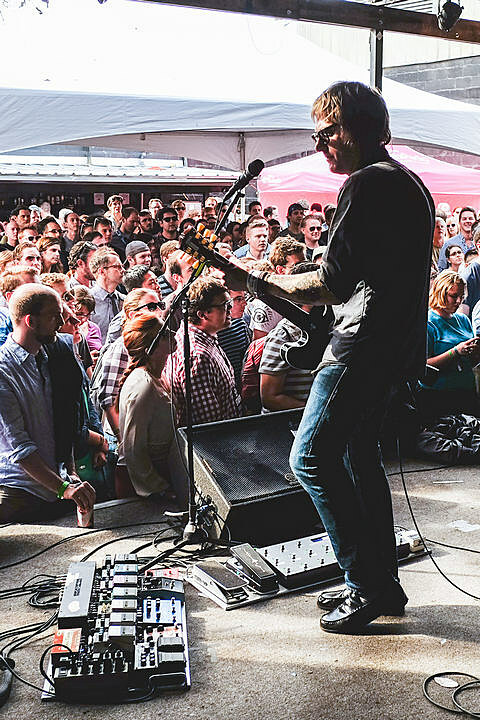 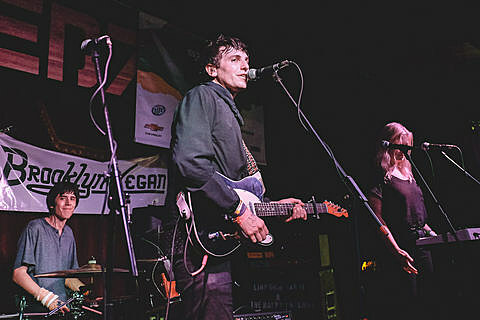 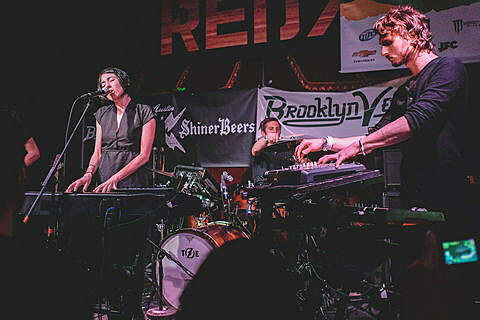 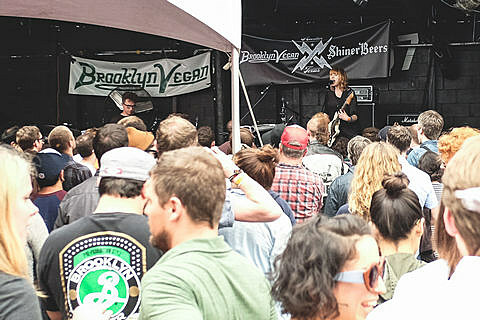 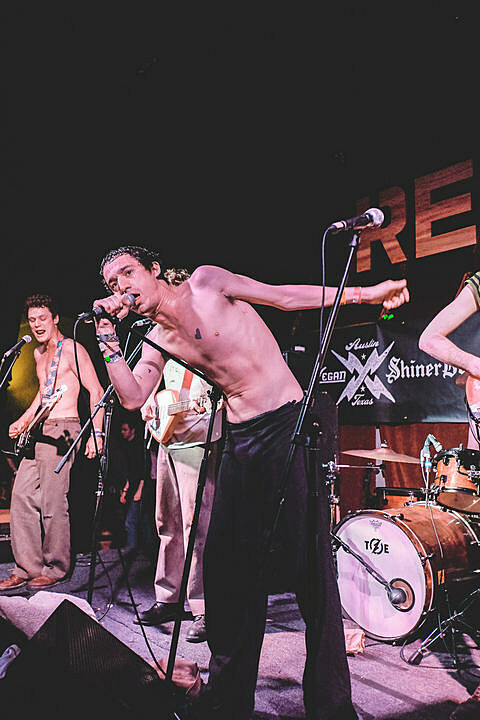 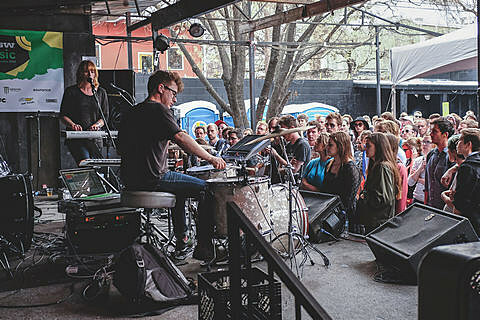 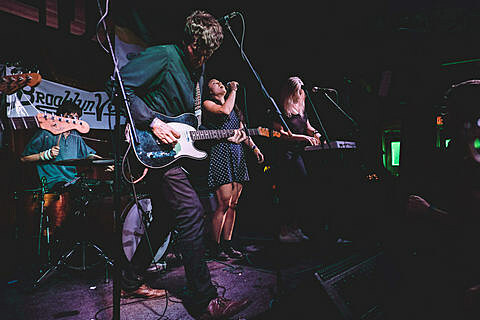 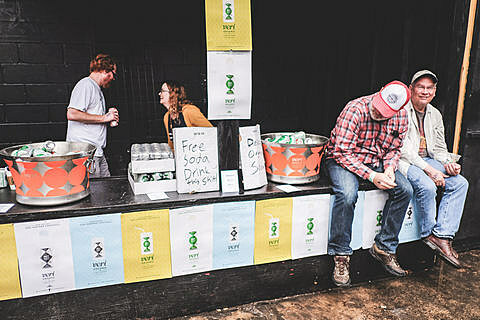 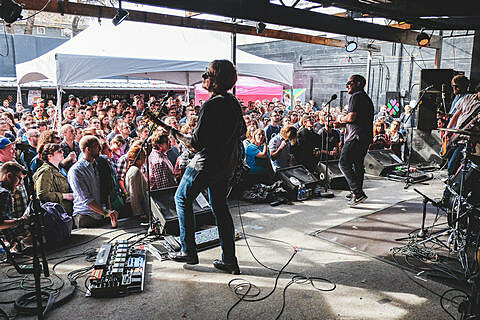 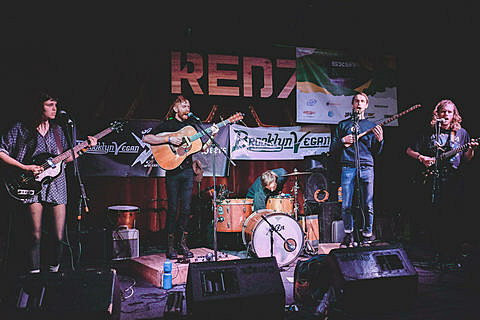 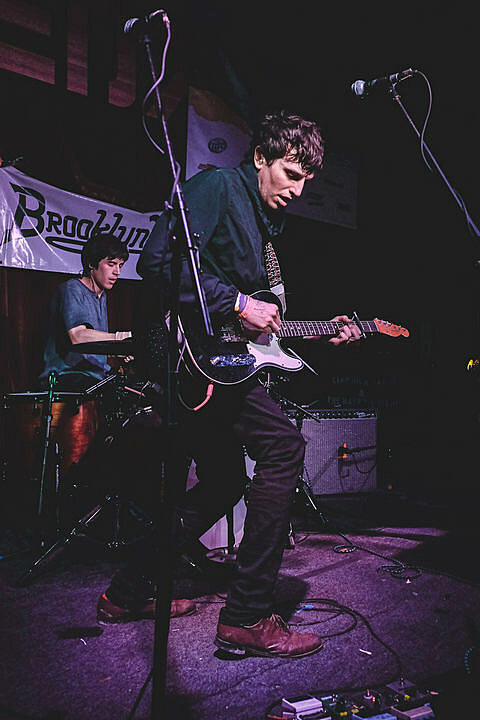 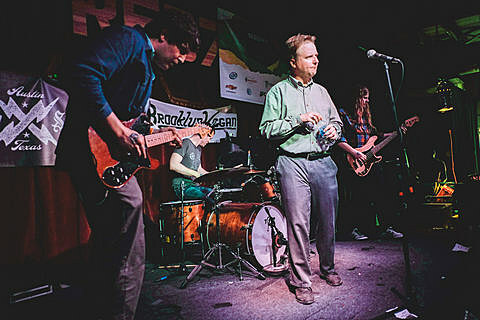 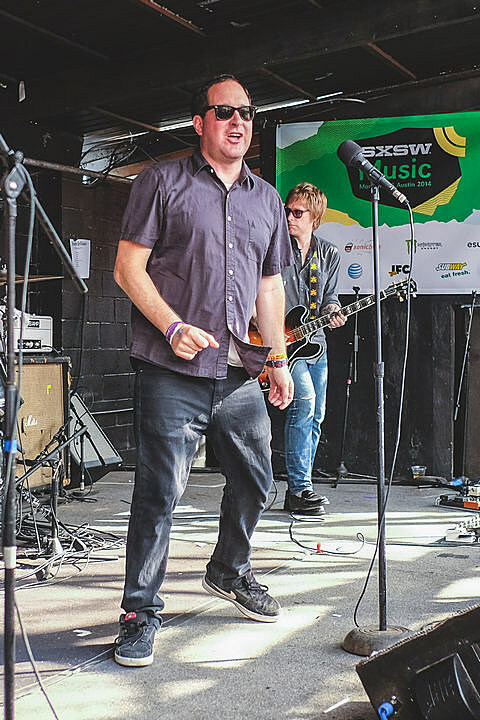 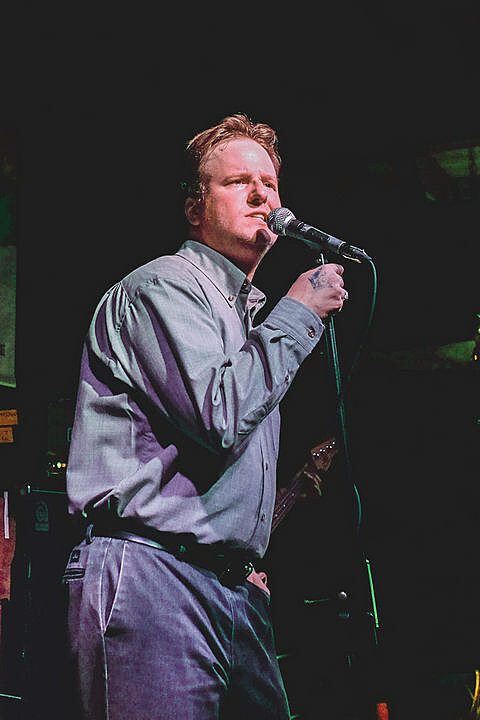 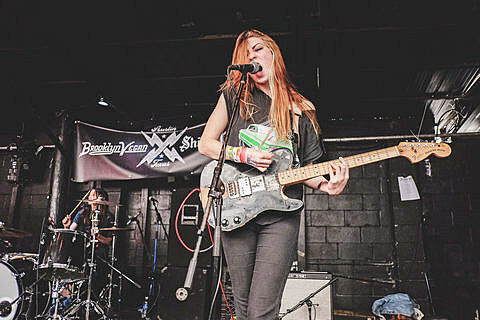 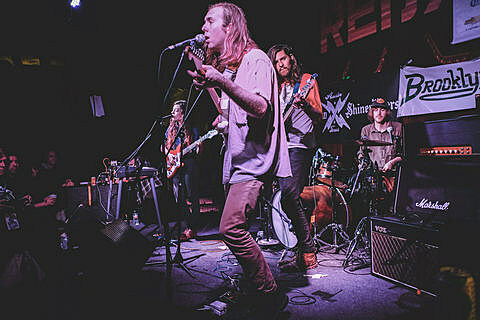 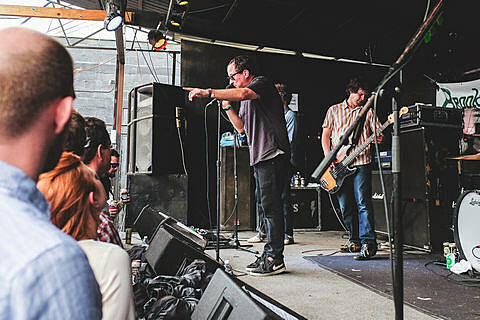 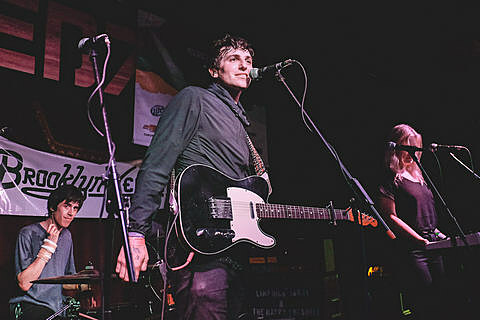 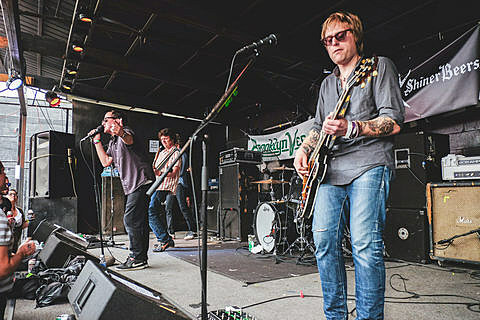 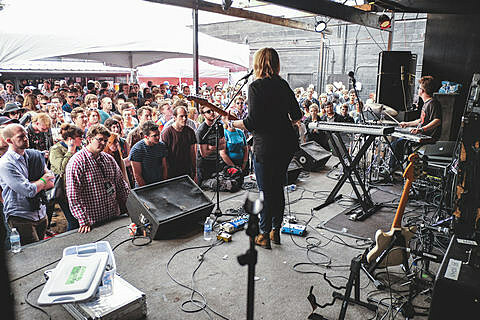 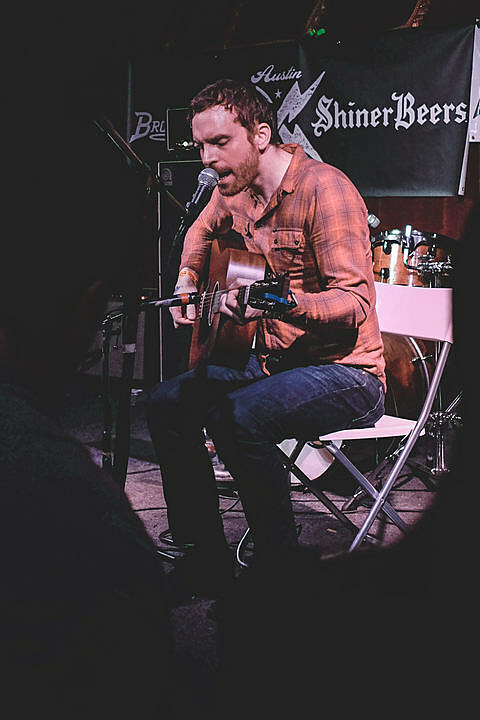 After Friday, which came after Thursday, which came after a night show on Wednesday, we said hello and goodbye to both of Red 7’s stages one last time with our third and final BrooklynVegan SXSW day party at the 7th & Red River venue in Austin on Saturday (3/15). 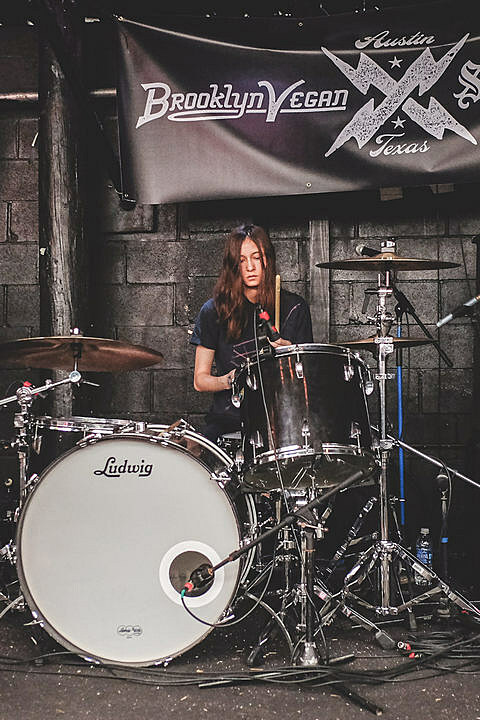 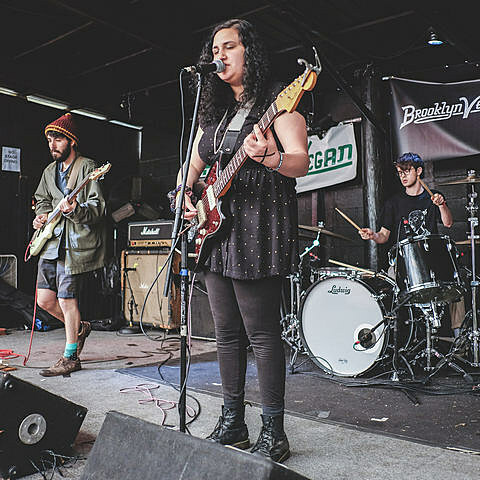 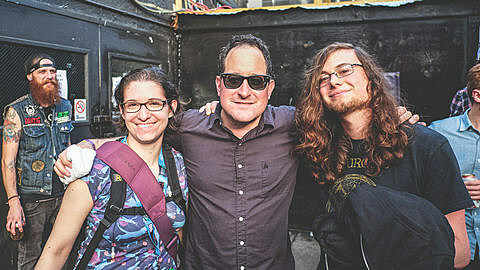 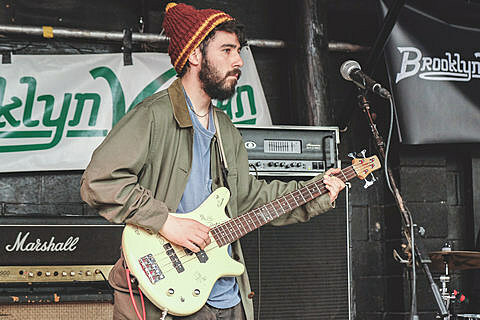 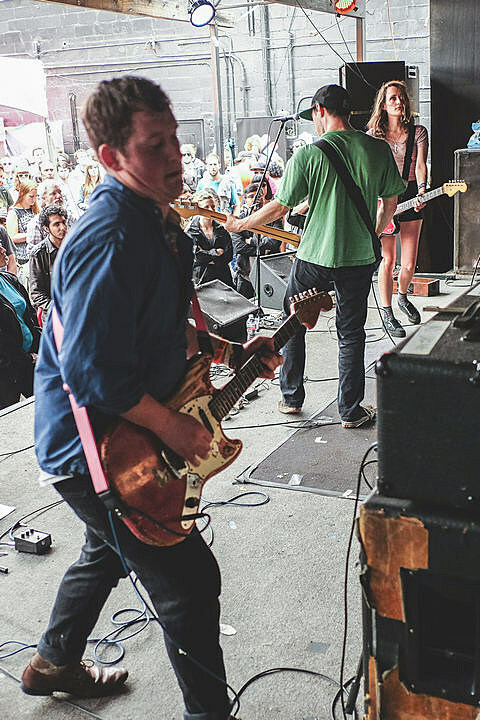 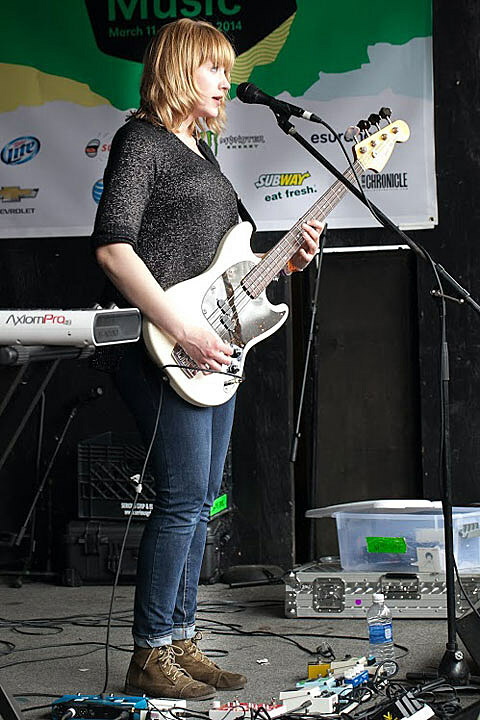 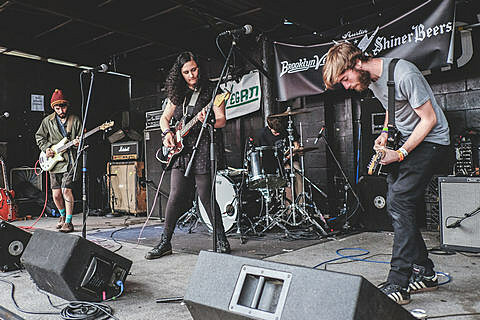 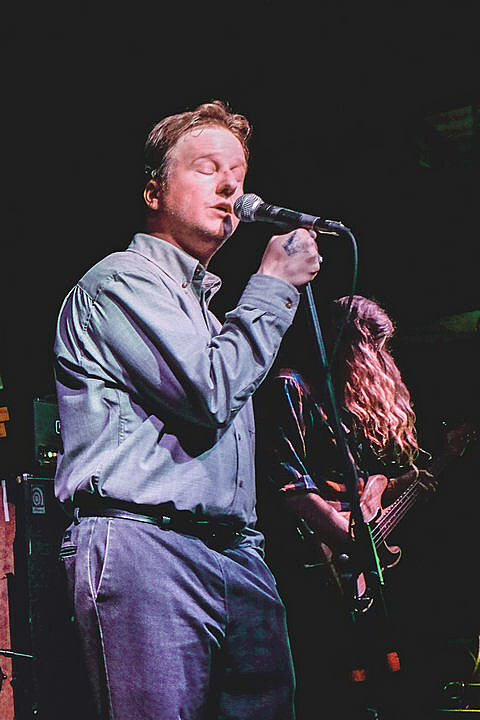 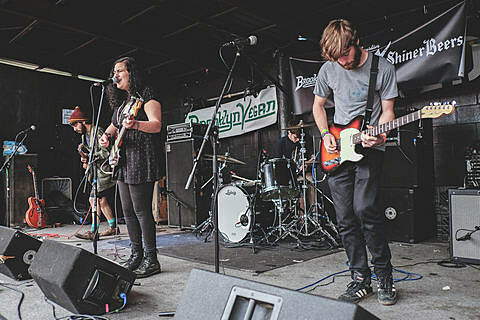 Outside, despite the rain that plagued us that day, Palehound kicked things off with their noisy indie rock, and they were followed by the high-energy poppy punk of Cincinnati’s Tweens. 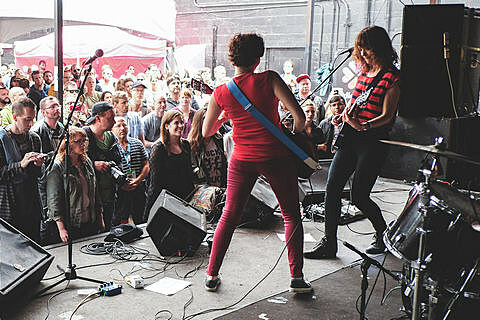 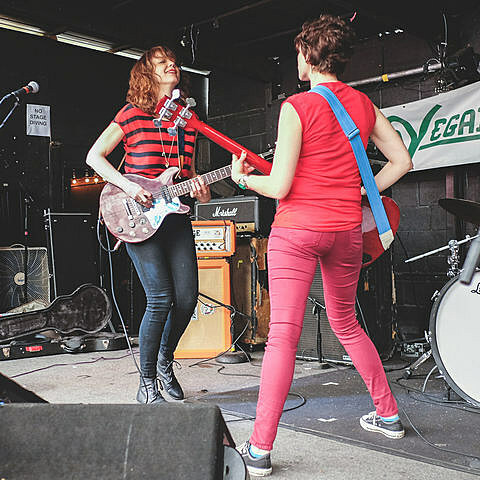 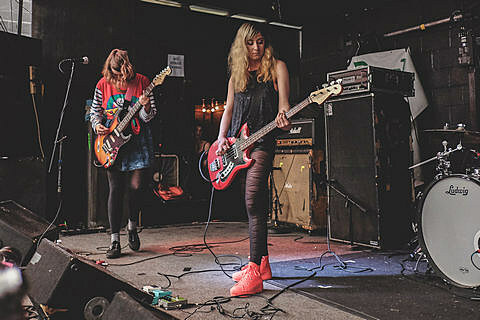 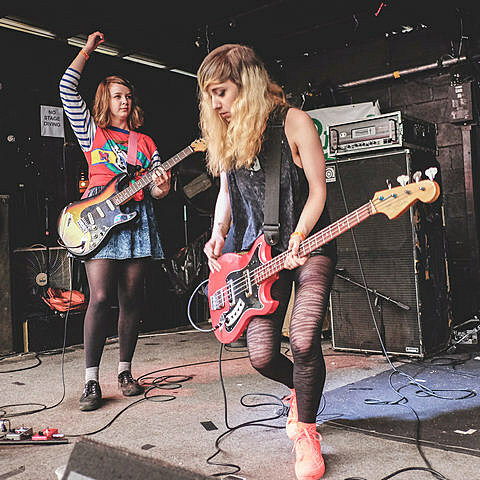 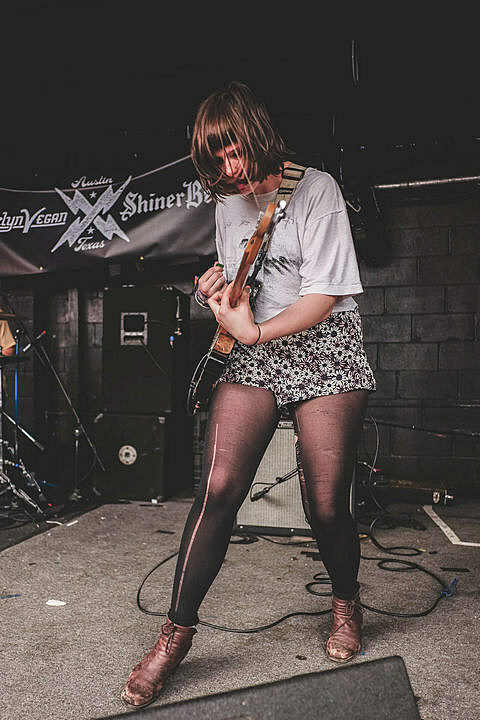 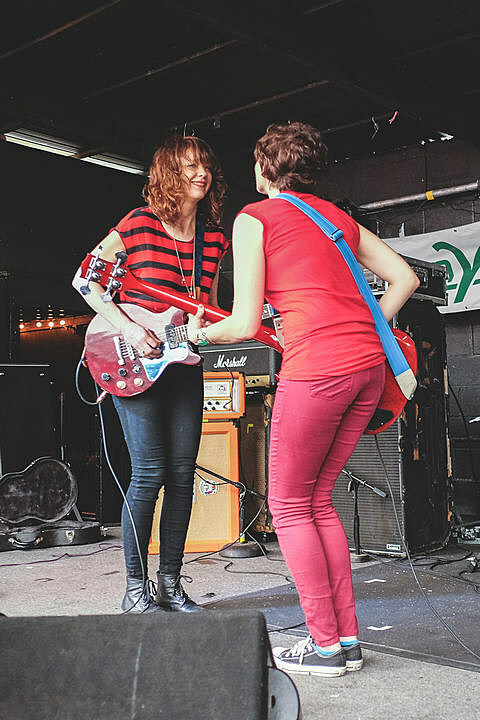 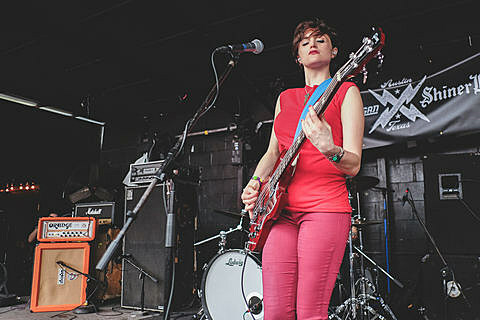 More poppy punk came from Northampton’s Potty Mouth, and then came Mary Timony’s (Autoclave, Helium, Wild Flag) riff-rockin’ new band Ex Hex, who were one of the most fun bands of the day to watch. 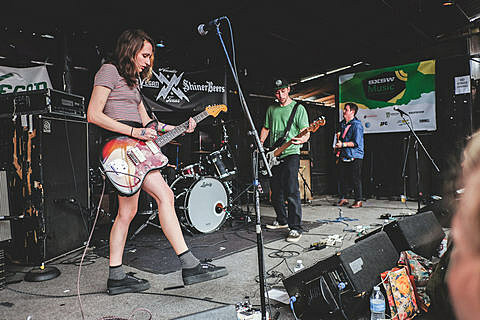 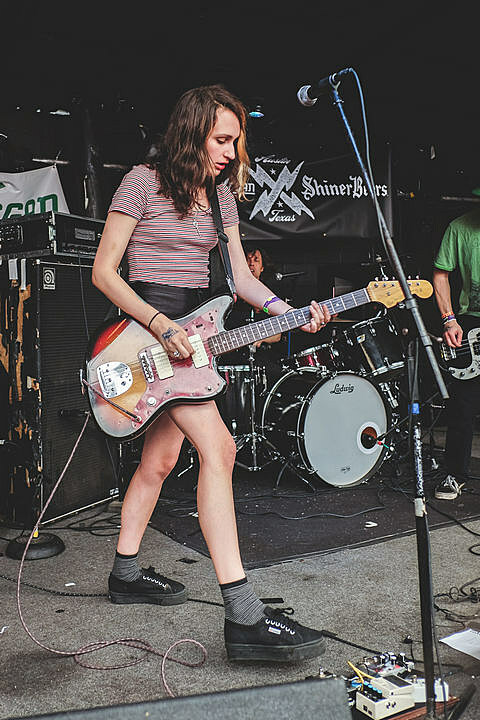 They were followed by Potty Mouth’s Northampton neighbors Speedy Ortiz, who were great as always, and whose new stuff (like “American Horror”) sounded great next to their older songs (like “Taylor Swift”). 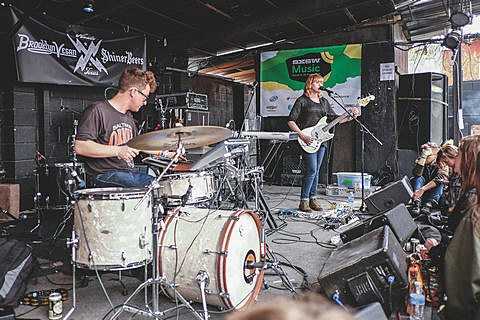 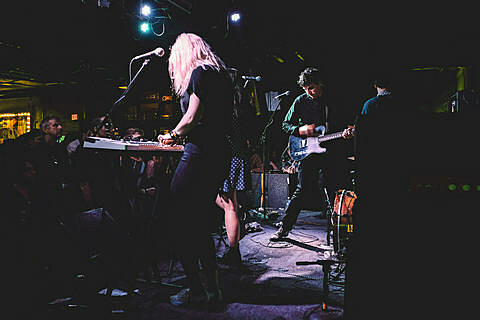 Wye Oak followed and previewed stuff from their upcoming guitar-less album (they did have their guitar on Saturday though), and the show closed with a super fun set from The Hold Steady. 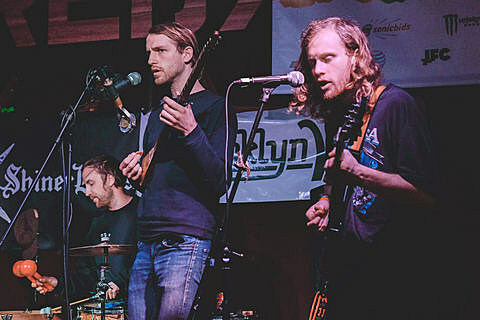 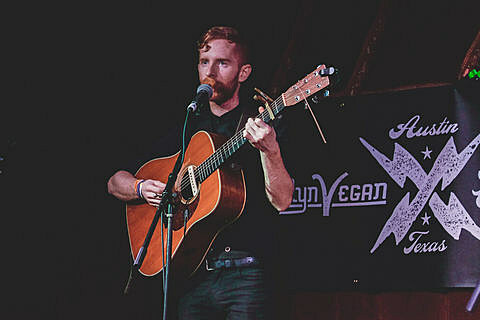 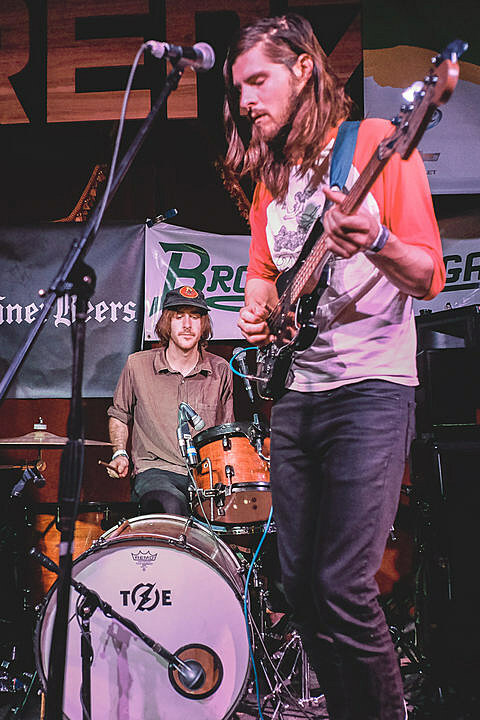 The indoor stage got off to a great start with Saintseneca, who had a tight blend of Fleet Foxes/Arcade Fire-isms, then it got weird for the UK’s Fat White Family, who brought filth and fury not unlike The Stooges or The Birthday Party. 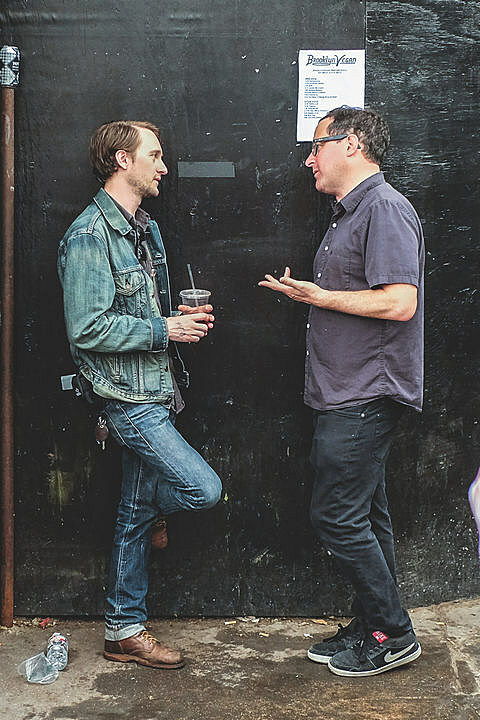 (They’re in NYC this weekend.) 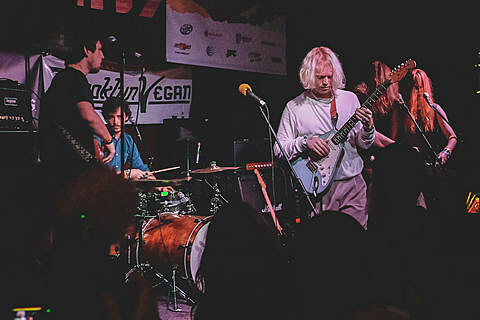 Quilt kept things trippy (but cleaner) after that, and Connan Mockasin was his eccentric self too (though he admitted he was recovering from the night before where he told everyone at Swan Dive to take their clothes off). 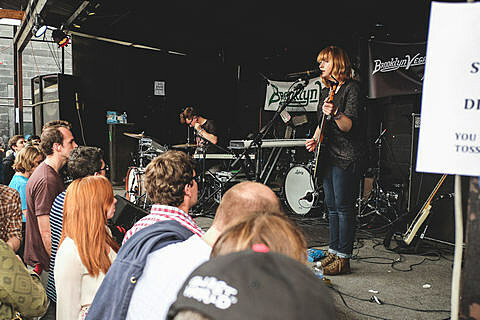 Then came the art pop of Hundred Waters, a mostly-solo set from Braid frontman Bob Nanna which included Braid songs and some Jack and Ace action with his wife Lauren LoPiccolo, sneering Detroit post-punks Protomartyr, and finally a headlining set from the new lineup of The Pains of Being Pure at Heart, which is easily their most powerful and fun to watch yet. 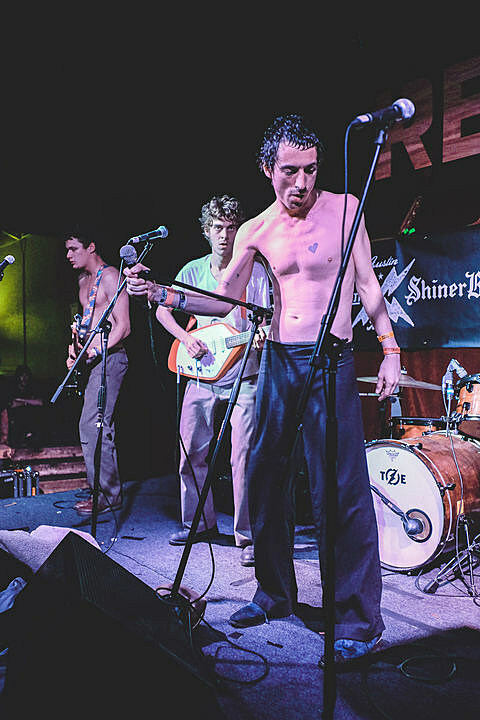 Shiner beer was on special and we gave away free Jameson. 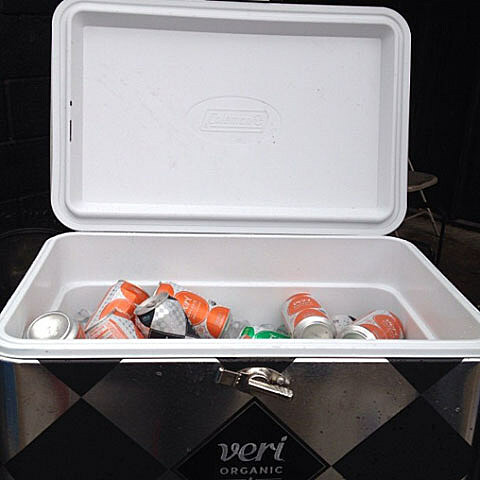 Veri organic soda was free, plentiful and was there to help you rehydrate. 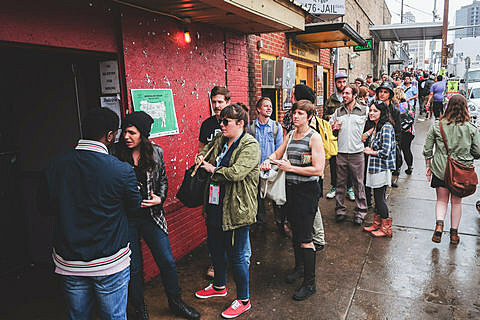 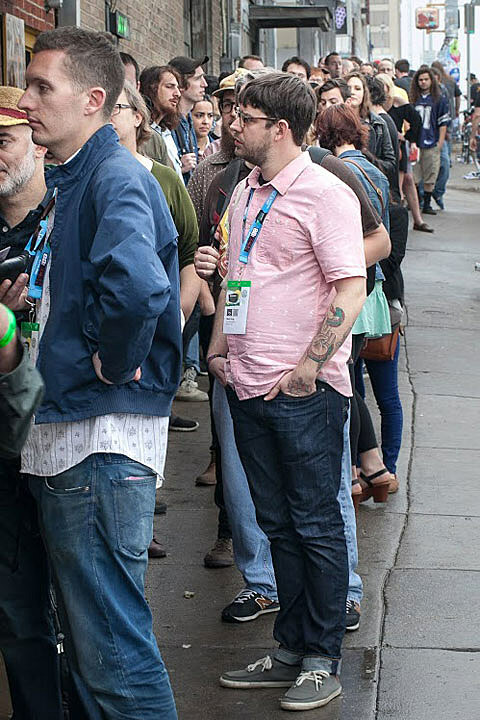 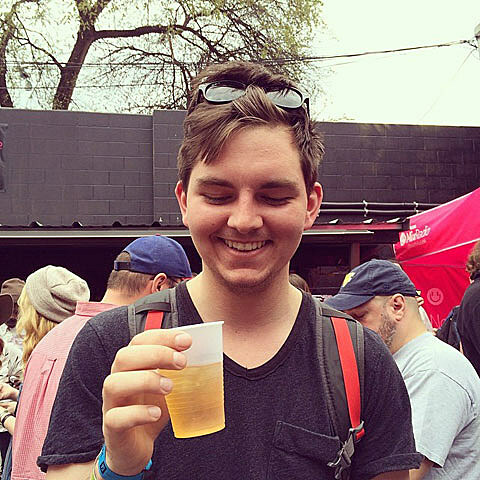 We let in 20 people each day who were taking advantage of Esurance‘s SXSW-wide #EsuranceAccess program. 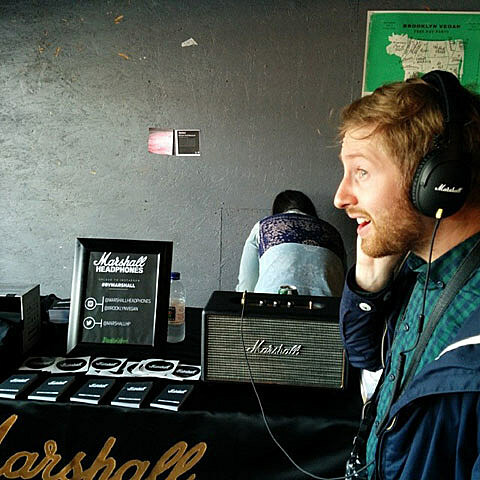 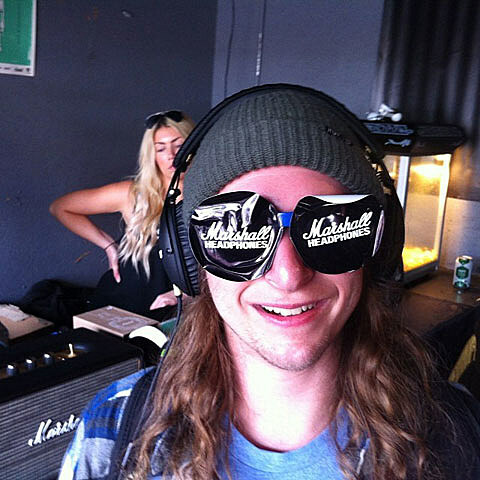 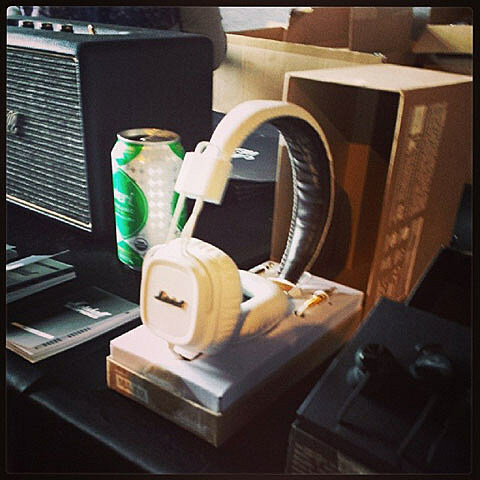 Maybe you won a pair of Marshall Headphones? 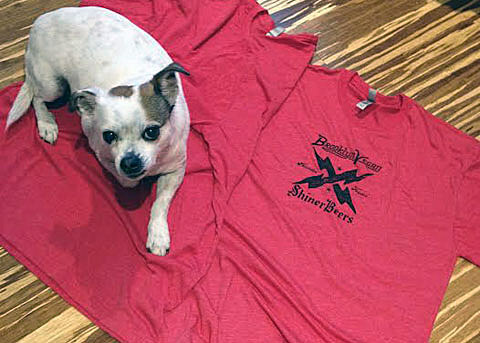 You may have if you tagged your Instagram with #BVMarshall (you may also see one of those Instagrams featured in this post). 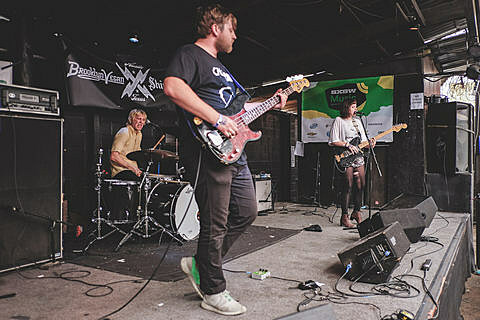 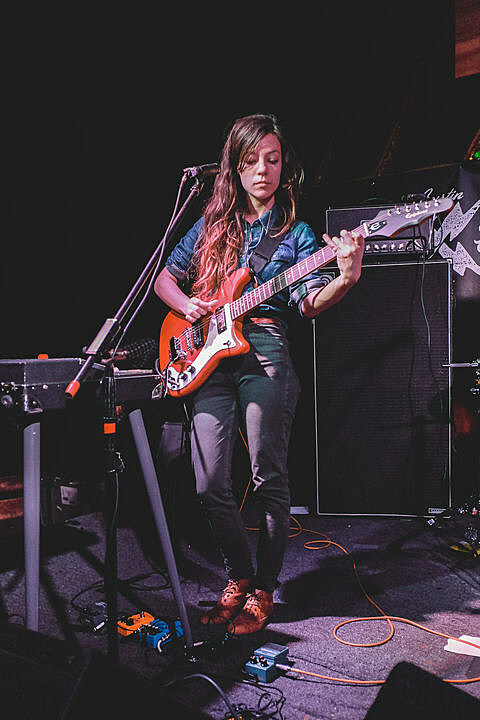 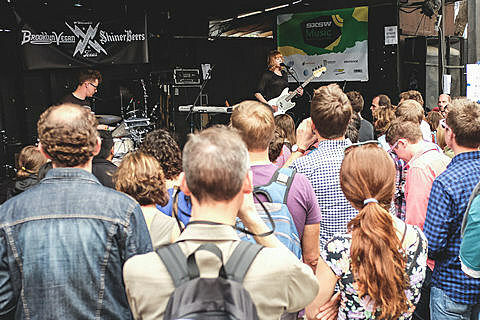 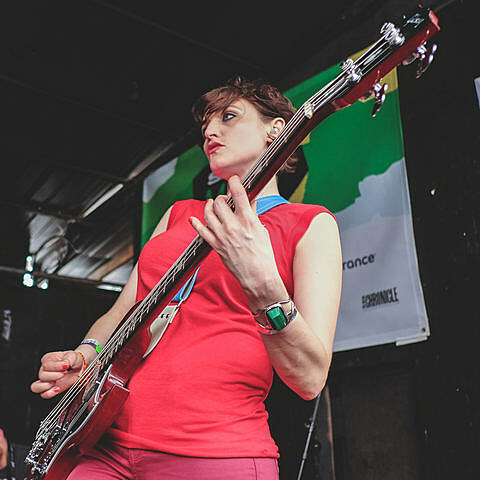 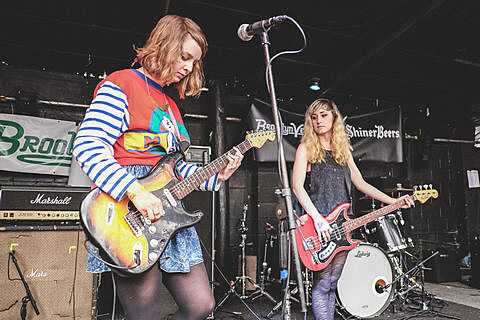 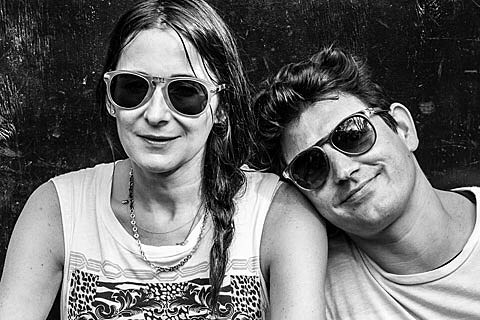 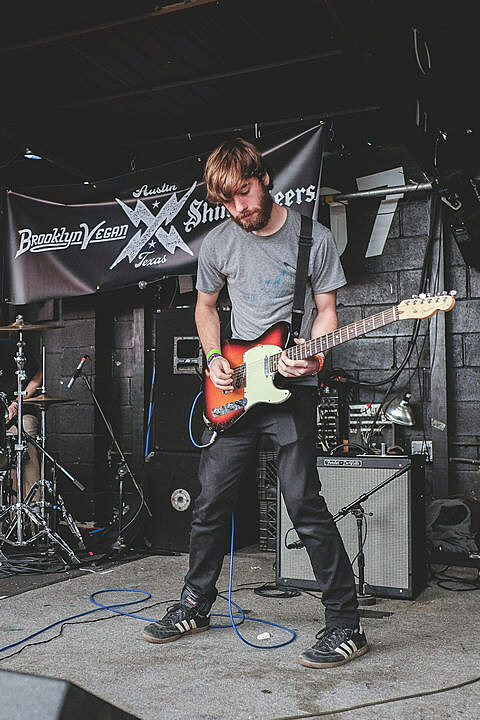 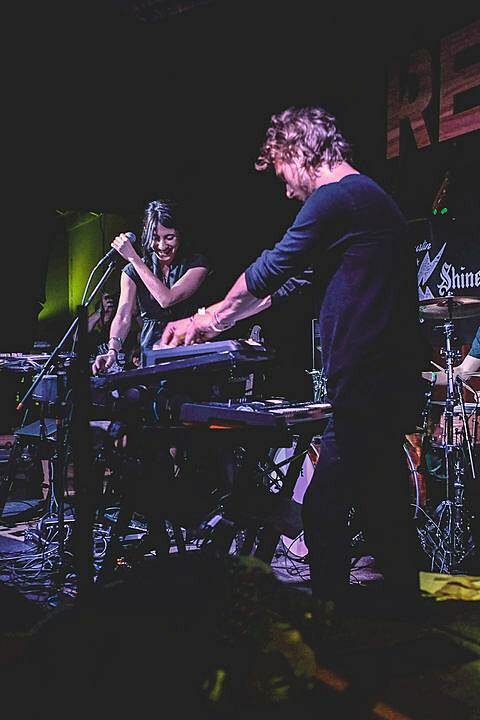 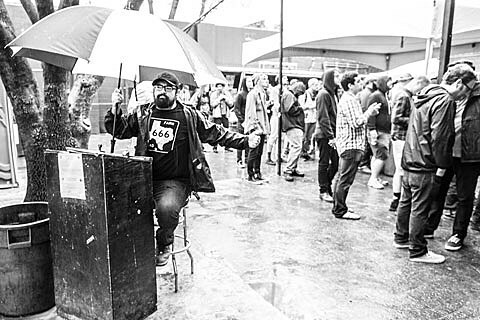 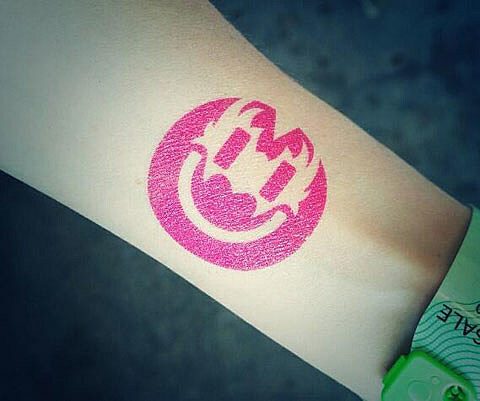 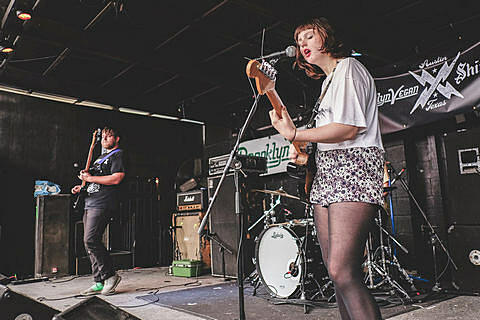 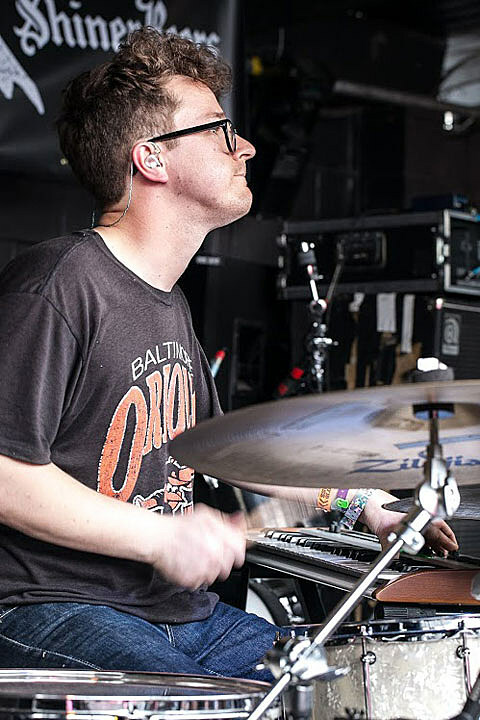 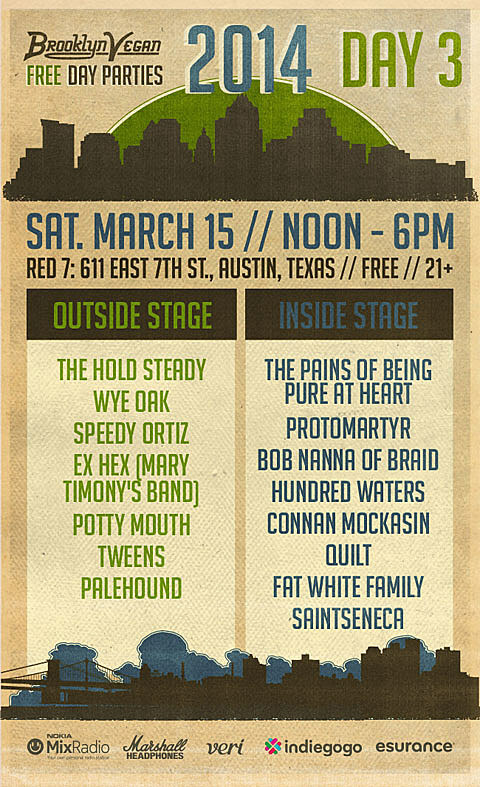 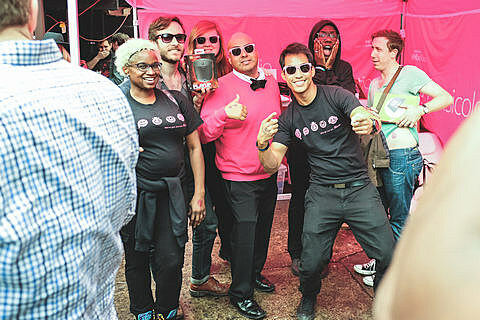 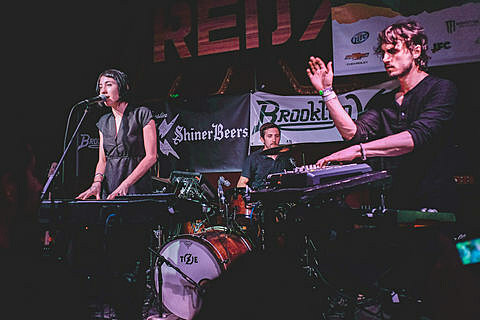 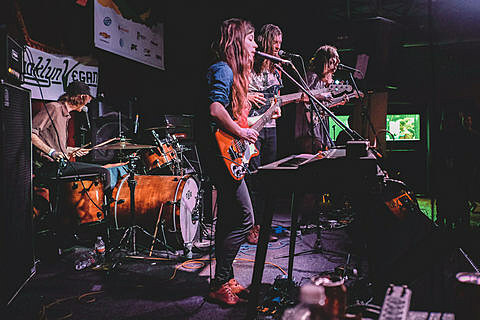 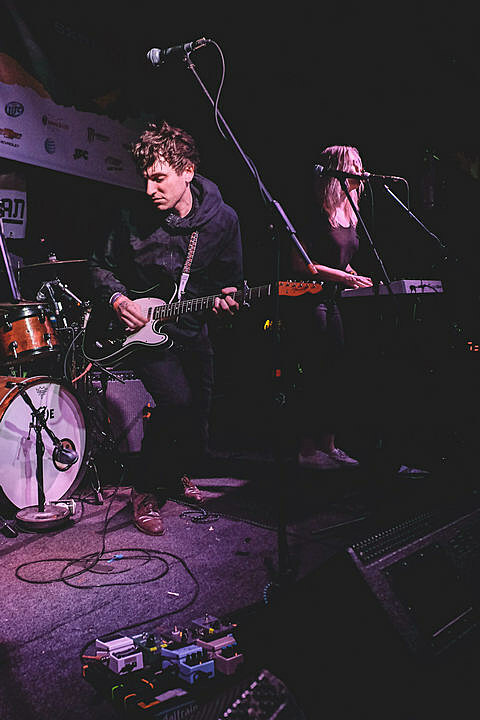 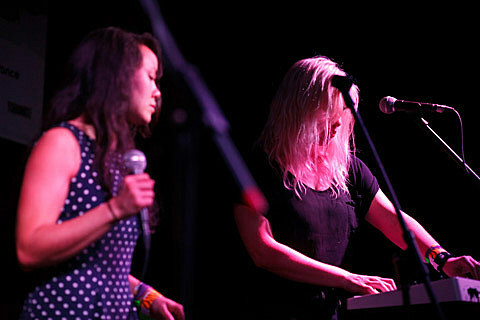 All the music we played between bands can be found on our Nokia MixRadio SXSW playlist. 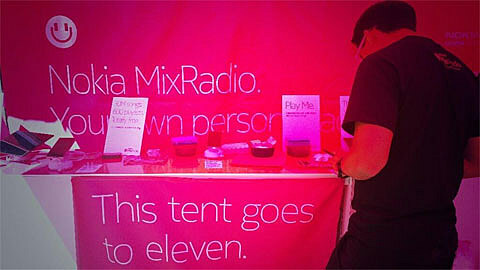 Nokia MixRadio were the ones in the pink tent outside all three days. 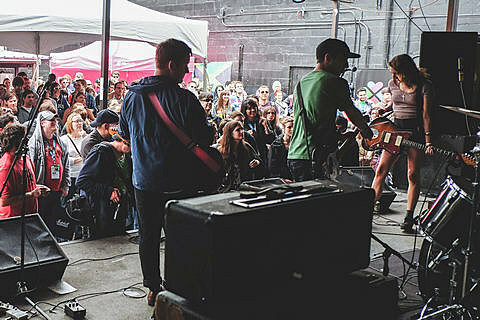 Indiegogo was there too, though due to the rain, like Marshall, they moved inside on Saturday. 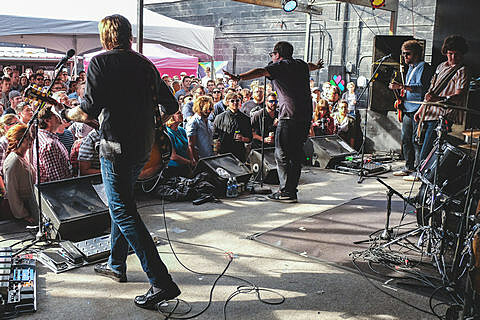 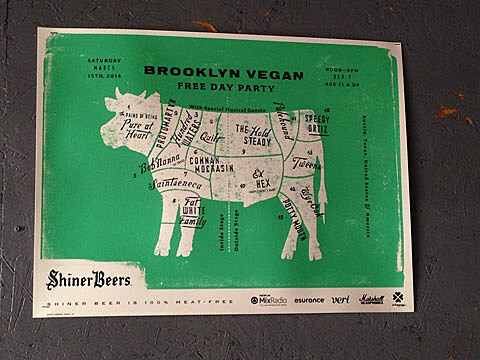 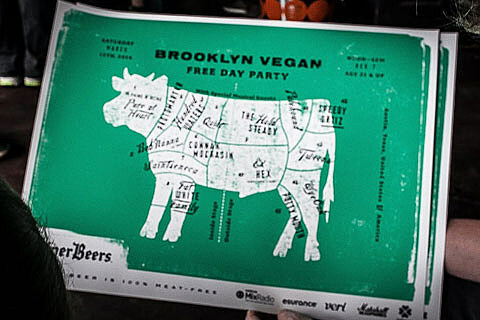 Special thanks to all of our bands and partners and sponsors for making this party possible. 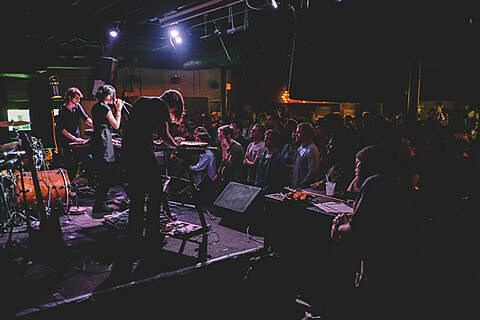 Pictures from Thursday HERE. 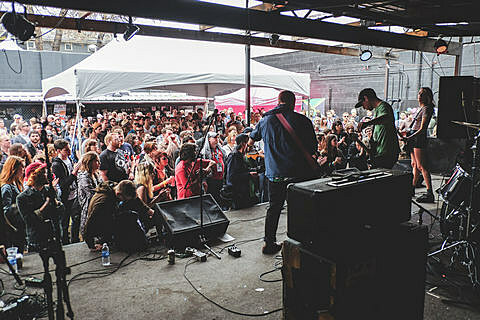 Pictures from Friday HERE. 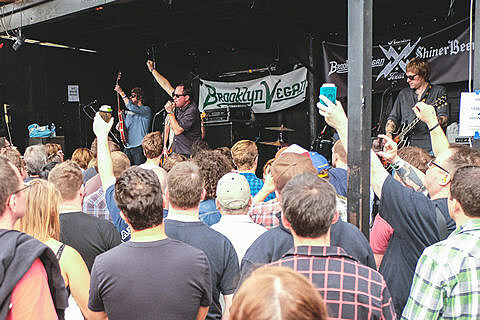 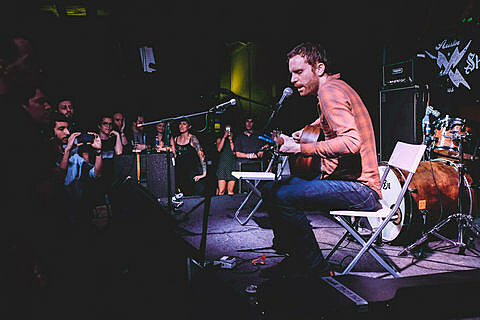 More from Saturday at BV Austin.